owner of Aquarian Bath, which produces a line of all natural soaps and bath products that are unscented or lightly scented, made only from pure essential oils and are palm-oil free. We thank her for contributing this informative article to the Mind Body Spirit Odyssey. Garlic is a common kitchen herb with many medicinal uses. It can helps resolve colds, coughs, sore throats, and sinus infections. Externally it can be used for skin infections. For chronic concerns, Garlic helps reduce blood sugar and high blood pressure. It is also helpful to treat Malaria and boost immunity for AIDS. It is famous as a de-wormer. I remember my grandpa taking it powdered on everything. The fresh garlic is the most potent to use medicinally, but I am just not one of those people who can handle a raw clove. The first time I tried raw garlic was in Belize. One of the locals was taking it raw and suggested I try it. Too strong for me! I could barely stand it. The last time I tried raw garlic was when I was really sick with a head cold. I chewed, swallowed and abruptly started into a cold sweat, drooling and was about ready to throw up. I given up on raw garlic for myself. 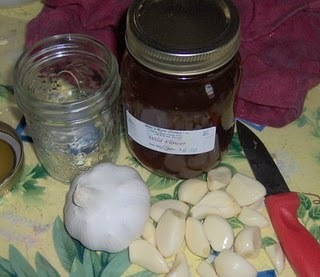 Now I use either cooked garlic or garlic in the sweet medicine form: Garlic Honey. 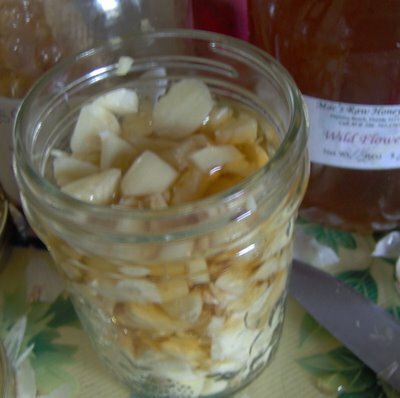 It's very simple to make Garlic honey for medicinal or culinary use. All you do is chop up a whole garlic bulb: peel and chop the cloves. Chopping helps release the most potent chemical ingredient in garlic is Allicin. Allicin is created when Alliin reacts with the enzyme Alliinase, which is activated when garlic is chopped or crushed. After your cloves are ready, put them in a clean pint jar. Cover with honey. I used raw wild flower honey. It takes a long time for the honey to seep through all the chopped cloves. So pour slowly. You can use a knife or a chop stick to get the air bubbles out from among the chopped cloves. The next step is to cover and label and date your jar and put it up in a cupboard for 2-4 weeks. You can use the honey with or with out the garlic at the end of this time. 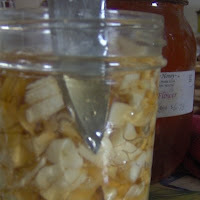 The shelf life of Garlic honey is 3 months. You can take this honey by the spoonful or add it to tea if you have a cough, cold or sore throat. 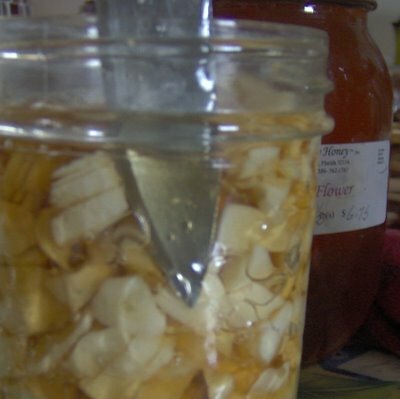 Wow I never thought of preserving garlic honey in a jar for future use. I just prepare them whenever I need them. Thanks for the great idea! Garlic is indeed one of the best herbal products available today. This product can even cure hypertension. Anyway, thanks for sharing this garlic recipe. Honey is one of the best flu remedies. Aside from the fact that honey makes the skin smoother and clearer, honey also gives relief to people who have cough and colds. Garlic is always available in our house, not only as a spices but also as a first aid especially for hypertension or high blood pressure. Honey is also best in treating cough and also a good sweetener, a way better than processed sugar. We've made this, and it's wonderful. You can eat the garlic/honey on muffins or bread...the honey really changes the flavor garlic. I would really recommend keeping it around during with winter months.